With Microsoft Your Phone, your iPhone's text messages and notifications can appear on your PC. 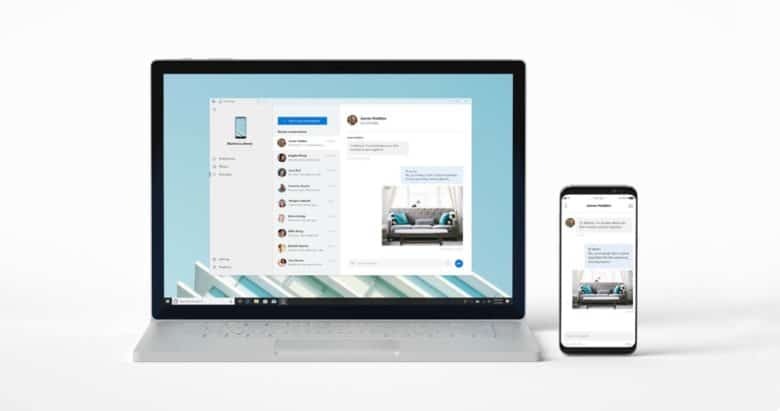 Microsoft unveiled an app today designed to allow Windows users to show the text messages and notifications from their smartphone. Plus, Your Phone will make moving images between phone and PC easier. Also at its Build 2018 developer conference, the company announced that the new Windows Timeline is coming to iPhone and iPad. There’s no iMessage for Windows, but Your Phone will bring some of the functions. You’ll be able to see your iPhone texts on a PC and respond to them. That said, Microsoft’s app won’t emulate all the features of iMessage, just texts. But that’s just the start. Your Phone will also be able to mirror iOS notifications onto the PC, and access iPhone images. The presentation at the Build conference mentioned dragging-and-dropping a picture from an iPhone into a Word document without touching the smartphone. Microsoft plans to release Your Phone to Windows Insiders this week. It’s not known when it will be available to all Windows 10 users. A major new feature in the newest update to Windows 10 is Timeline. This is sort of like a browser history, except that it compiles a list of everything you do, from word documents and spreadsheets to web sites. Microsoft said today that it’s bringing Windows 10 Timeline to iPhone and iPad. Naturally, it will only track its own apps, including the iOS version of Edge. Cross-platform applications are completely in-line with Microsoft’s strategy of cooperating with Apple rather than competing with it. Other examples include Office 2019 for Mac, and the addition of iTunes to the Microsoft Store.